First off, let me apologize for not writing in a while, but I’ve been busy doing things like re-working a bar program, writing a chapter of the next Food & Wine Cocktails book, helping found a bartender’s guild, planning seminars for the upcoming Czech Bar Awards, and coming up with recipes for the next Hendrick’s gin book, all the while dealing with work, travel, family and the recent influx of visitors to Seattle. Mixology Monday, hosted by Joe and Dinah over at Bibulo.us, has finally dragged me to the keyboard with an interesting theme this time: Nineteenth Century Cocktails. Combing through my sources and finding a lot of plagiarism between authors as well as an awful lot of bizarre (and not in the good way) concoctions, sometimes with ingredients that are now defunct, I began to worry that it would be next to impossible to find a unique entry that would also be palatable. Then I came across Leo Engel’s 1878 opus, American and Other Drinks. While my eyes flitted over such concoctions as the Flip Flap, Heap of Comfort, the Magnolia (a la Simons) and the Square Meal (which could’ve been substituted for one, what with the two egg yolks and salt and pepper before we even get to the boozy ingredients), it was the Alabazam (it should really have an exclamation point after the name, shouldn’t it?) that intrigued me enough to actually waste good booze on a trial run. One tea-spoonful of Angostura bitters; two tea-spoonfuls of orange Curaçoa; one tea-spoonful of white sugar; one tea-spoonful of lemon juice; half a wine glass of brandy. 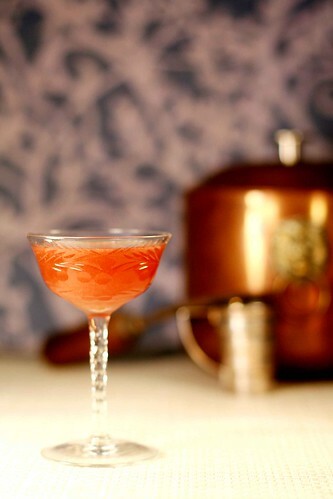 Shake up well with fine ice and strain in a claret glass. The Criterion is a restaurant which still exists in London’s Piccadilly Circus to this day, although I suspect in a much smaller format as this celebrated bon-vivant’s tome makes mention of a smoking room, a grill room, a cigar shop, the buffet lounge, the west, east and south rooms as well as private dining rooms and the grand hall, not to mention the Theatre. What intrigued me about the Alabazam, besides the name, was the use of a whole teaspoon of Angostura. As anyone who regularly uses bitters knows, this is an enormous amount of product for something that is usually measured in drops and dashes, but, tempered with the sugar and Cointreau, it really works in this drink. Deep red rust in tone and with tons of spice from the Angostura, this cocktail will cure what ails you as you step back in time to an era where drinking was about more than getting blotto’d, it was about following doctor’s orders. ~ by Jamie Boudreau on September 16, 2008. Wow, brilliant! Any thoughts on using other bitters for a variation? Tried it, really liked it. Definitely an after dinner drink though, I sent one over to one of my regulars not realizing she still had some wine in her glass, she liked the drink but needless to say her palate was pretty much toast. I suppose the recipe would work for booze besides the cognac too, perhaps a whiskey, or a rum version? One can only try it to find out…. Beautiful with xo cognac and meyer lemon juice. Wow, I love it. tried it with Chalfonte, and I’m hooked. The drink really evolves in your mouth, going through all the flavors. thanks! I ran out of cointreau so I substituted patron citronge, and rather than angostura, I used fee brothers whiskey barrel aged aromatic bitters.